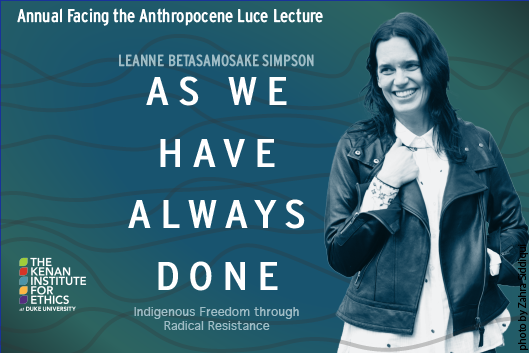 Leanne Betasamosake Simpson is a renowned Michi Saagiig Nishnaabeg scholar, writer and artist, who has been widely recognized as one of the most compelling Indigenous voices of her generation. Her work breaks open the intersections between politics, story and song-bringing audiences into a rich and layered world of sound, light, and sovereign creativity. Her latest book, "As We Have Always Done: Indigenous Freedom Through Radical Resistance" was published by the University of Minnesota Press in the fall of 2017, and was awarded Best Subsequent Book by the Native American and Indigenous Studies Association. Leanne is also a musician combining poetry, storytelling, song writing and performance in collaboration with musicians to create unique spoken songs and soundscapes. Leanne's second record f(l)light produced by Jonas Bonnetta (Evening Hymns), was released in the fall of 2016. She was awarded the inaugural Outstanding Indigenous Artist at the Peterborough Arts Awards in 2018. Leanne is Michi Saagiig Nishnaabeg and a member of Alderville First Nation.